What is the best way for a solo traveler to explore a foreign city? Destination logistics is always a challenge, especially when you don't speak or read the language. One easy solution? The big red double-decker, open-top City Sightseeing Hop-On Hop-Off bus. Although these tour busses are painfully touristy, I have been using them for the last 15 years and have never had a bad experience. City Sightseeing was started in 1999 in Seville, Spain and has grown into a highly recognizable brand located in 90 cities across six continents. The company offers high standards for comfort, reliability, and substantive destination information offered in many different languages, strategic stops, and easy ticket purchasing no matter what city you are in. Many of the buses now have wheelchair lifts for the handicapped traveler. Tour tickets are good for one or two days depending on the size of the city and how many routes that are offered. The buses usually run from 9:00am to 9:00pm. When entering the bus you are given earplug headphones that supply you with interesting information during the tour on all of the city's major sites, numerous important historical and cultural facts that are interspersed with entertaining ethnic music to put you in the relaxed frame of mind. They are a good way to learn the layout and get the feel of a city, particularly if it's a sprawling metropolitan area. Even though I do a lot of pre-trip research and develop an extensive sightseeing list, I always try and start my visit with what I call a reconnaissance run which gives me real time knowledge of where all the major sites are and how far they are from each other and my hotel. Stops and pick up points are strategically located. Every time I have taken a Hop-On Hop-Off tour, the pick up point has been within easy walking distance from my hotel. Also, if I am sightseeing in a particular area of a city, a stop is usually readily accessible within blocks of where I am. It saves money on cab fare. I use the Big Red Bus as my continuous taxi service, which is cheaper and easier to engage, especially if I am in a city where I am not fluent in the language. Typically, the buses arrive at the stops every 15 to 30 minutes depending on the size of the city. The tours help me get over my culture shock when visiting a new city. The recorded commentary outlining important historical and cultural facts such as significant historical events, monuments, buildings, museums as well as popular shopping and entertainment spots, which are interspersed with pleasant ethnic music of the region, are a great introduction. This presentation helps me remember and understand what I have read prior to leaving home from my pre-trip research. I like to say, "It helps me get into the flow of the place," or as when I was in Athens, an "Athens frame of mind." Hop-On Hop-Off tickets are affordable and easily purchased from multiple sources. I get my hotel concierge to secure my ticket, but you can purchase them at any of the bus stops, local tourist outlets or on the Internet from their website. Tickets are well priced and typically cost between $20-$30. Riding in an open top bus is so enjoyable-even more so when the weather is nice. It's like touring a city in a convertible. If it's raining or it's too hot or cold you can always retreat to the bottom level of the bus. Tip: don't forget your sun visor. The buses are great for taking pictures. The open top gives you a unique vantage point from which to take pictures. You are above street level which gives you 360-degree angle to shoot that perfect photo or video. Some of my most stunning photos have been taken on these bus tours. You can make your own sightseeing schedule. This is one of the biggest pluses of this service that other bus tours don't allow. You can linger as long as you would like at a museum or in a shopping area, have a leisurely lunch somewhere on a whim, or just savior what you are experiencing without having to cut it short and head back to a meeting point at a specific time as on an organized tour. The added freedom to manage your daily itinerary relieves travel stress and let's you enjoy what you like best for as long as you want. You are less likely to get lost in an unfamiliar city. If you keep the map of the Hop-On Hop-Off stops and you get turned around, just ask someone where the nearest pickup point is located. Go into a restaurant or shop and request help with finding the nearest stop. Once you get back on the Big Red Bus, you know you can find your way back to your hotel. 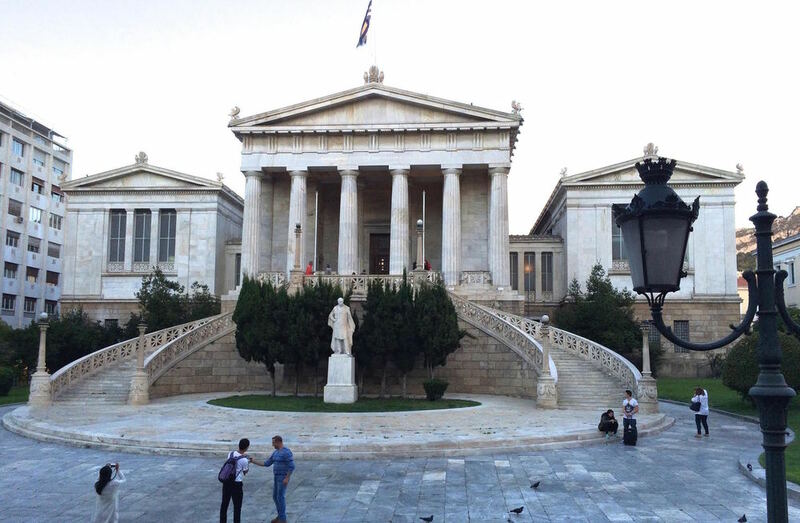 Athens is a vast metropolis littered with ancient sites and modern areas. To adequately experience this historic, cosmopolitan city, you either have to take organized tours or hire a private guide and driver. It is impossible to see Athens totally on foot and, for the American or foreign traveler who doesn't speak or read the language, resorting to taking the city transport is a gamble. The Athens Big Red Bus tour solves most of your logistical sightseeing problems with two different route options. 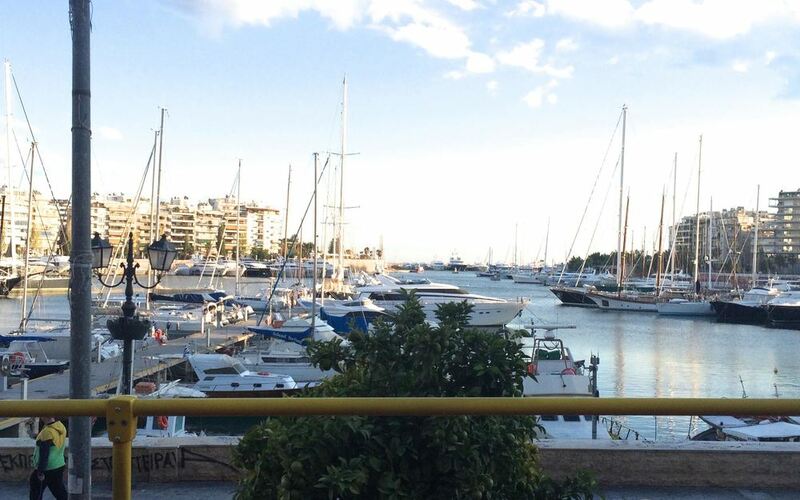 The red route focuses on the historical areas of the city and the extended Green/Blue route takes you to the more modern areas and to the Piraeus where the nearby harbor and seaside are located. You can combine the two easily. The red route takes one hour and the combined routes take 90 minutes to two hours depending on if you can readily get on the second bus (sometimes it's full and you have to wait for the next bus). The red route has 15 stops and the combined route has 27 stops. Of course, I took the combined option. Below are some of the photos from my tour. The weather was beautiful which made the experience delightful. After reading this post I hoped you are consider giving City Sightseeing Hop-On Hop-Off tour a try on your next getaway. For the solo traveler, the Big Red Bus tours are a great way to introduce you to a new destination. These enjoyable, informative and affordable tours can't be beat. For an additional understanding of the Athens tour, view the following video. If you found this post helpful or informative, let us know in the comments below and share with someone who you think might enjoy it as well. Feel free to ask us anything! Follow us on social media for more affordable luxury solo travel tips, tricks, stories and advice. Click on the links below!